After working in this industry for more than 10 years, it’s become apparent that (more often than not), we attract wedding photography clients that reflect who we are. Perhaps it’s in their personalities, beliefs or values, and this could translate into a good or bad thing for your business. If you’re getting your ideal clientele, then great - keep doing what you’re doing! 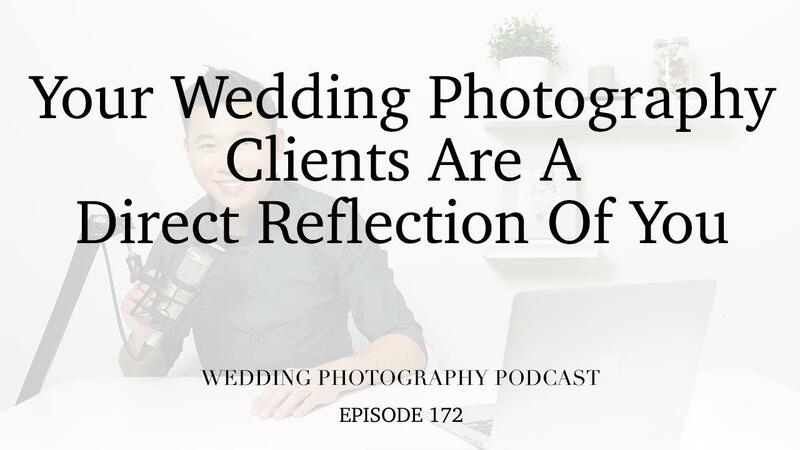 Obviously, you have a clear idea of who you are as an individual and are authentic in how you present yourself to wedding photography clients. However, if you’re constantly getting inquiries from clients asking for a discount or those who are micromanaging you throughout the day, then it might be time to take a good, hard look in the mirror. In this podcast episode, we’ll chat about why people want to do business with people who are similar to them and how this makes clients feel comfortable. Maybe you’ve noticed that your clients are just as reserved or outgoing as you are. Or perhaps you feel that your clients don’t trust you. Does this reflect your own lack of trust in the way you interact with people? So if your business isn’t going well, it might be time to question why you’re getting the types of clients you are and what this really says about you.